A single-ion quantum magnet with characteristics surpassing all previous quantum magnets reported to date. The (quantum) tunneling of the magnetization is a fascinating effect that allows a spin to reverse its orientation without climbing the energy barrier separating opposite spin projections. This effect has been extensively studied in so-called single molecule magnets (SMMs) that are built from magnetic clusters embedded in a complex host. The interest ranges from basic research (resonant tunneling, topological interference) to potential applications (quantum computing, data storage). In addition, the results show that the dependence of the tunneling rates on the strength of an applied transverse magnetic field is substantially stronger than in SMMs. 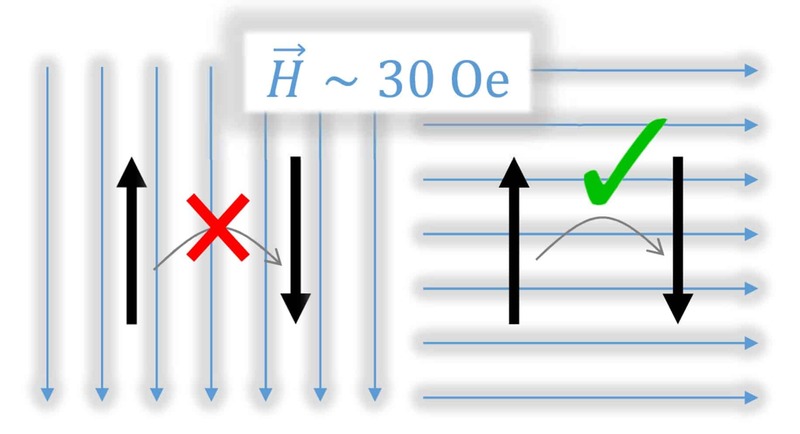 In particular, we show that a transverse field of 30mT is enough to completely saturate the magnetization of the system at a QTM resonance, in sharp contrast to required fields around a Tesla in the prototypical Mn12, to name the best-known SMM (more that an order of magnitude difference). Equally important, our results show that the relevant operating energy windows governing QTM in this system are extremely sharp – a direct consequence of the strong dilution of Fe within an insulating matrix and the low defect concentration in our solid state crystals (in comparison to less robust molecular crystals of SMMs). This allows to tune the system between on- and off- resonance by applying minuscule fields of 2-3 milliTesla (much less than in any single molecule magnet), with a corresponding change in relaxation time from 3 hours to 5 years (four orders of magnitude)! In other words, it is possible to preserve the state of a magnetic bit by applying a tiny magnetic field and make it again switchable by ramping the field to values close to zero, allowing an unprecedentedly fast manipulation of the magnetic state of the system. The results have been recently published in Physical Review Letters. See other articles on this and similar topics. See more on this particular research topic.